Lets be honest, a good military/war movie is few and far between. Most of the time they are too long, unrealistic, or sometimes fake. However, my favorite military movie shatters all of those misconceptions and proves that a good military movie is equatable to a diamond in the rough. This movie that I have selected is the 2000 film, The Patriot. Coming in with a solid 7.1 rating on a 10 scale on the International Movie Data Base, (IMDB), this movie takes place during the Revolutionary War. Starring lead actors such as Mel Gibson and Heath Ledger, this movie was highly anticipated upon it’s release and is still popular today. The plot is simple, as the movie begins with Benjamin Martin (Gibson), living in a small cottage located in a rural town in what is suspected to be South Carolina. As the movie progresses, government intolerance and violence continues to build between the American colonists and the British military. While facing personal adversity and turmoil, raising and supporting a family, and defending and fighting for what he believes in, Martin and his local neighbors join their local militia and join the Revolutionary War. To be blunt, the rest of the movie is history… PUN INTENDED. It’s hard to give an in depth synapses with this movie without spoiling it, and this movie is certainly good enough that I would not want to do that to anyone. My favorite part of this movie is the personal fictitious story line of Gibson’s character throughout. The plot is well developed, the setting looks incredibly realistic, and several scenes are well filmed, strengthening the level of cinematography. Additionally, I commend the director, Roland Emmerich, for his selection in a film like this. 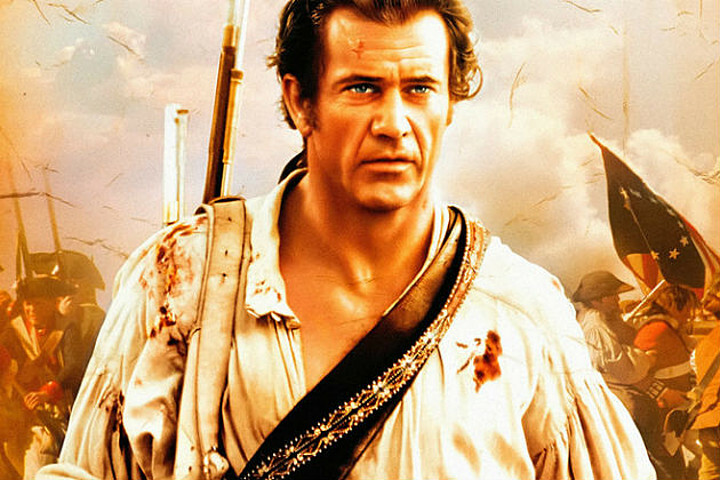 If you think about it, are there really any other movies that are based around the Revolutionary War? Not at all… This movie is original and unique in it’s own form and that alone makes this movie one of my all time favorites. On the contrary, there are a few aspects of this film that I do not necessarily enjoy. Like I mentioned in the very beginning, military movies are often too long. This movie alone is almost three hours long and at times, that can make some parts of the film be dry and uneventful. It is definitely a film that requires full attention and maybe even a background on this topic. Additionally, this film may not be suited for young kids. At times, there are some gory and daunting scenes that could give any kid nightmares for a week. Applying this movie to our society though is still prevalent today. Unfortunately, there is a lot of corruption occurring within our government and society in general. At times, I almost want to put this movie on a big screen all across the country to remind them what kind of country we are. A country who can unite and do great things. A country that fights together to achieve a same common goal. Most importantly, a country that exists in the realm of freedom, liberty, and the opportunity to succeed in life. This is certainly a movie that you should watch if you haven’t already! Great movie! fantastic choice, I completely agree with you, its a must watch. Its the classic story of a man from meager means who joins and leads a rebellion. Its the underdog story we all love and with the historical context there is no way to can not cheer for Gibson in this movie. Its a classic good heated American movie that leaves you with an intense sense of national pride. I do however agree it is a very long movie that has its dry moments that i think are necessary the historical references to be shown in a true manor. although, the movie is long I think it does a great job keeping all the clothing and props to appear to be distinct to this time and place. Although its not a children movie I think it is appropriate for the audience it is trying to reach. The patriot is a great classic and I agree with all the points you have made. Great taste in movies, I love it keep it up. Leave a Reply to tjd5567 Click here to cancel reply.